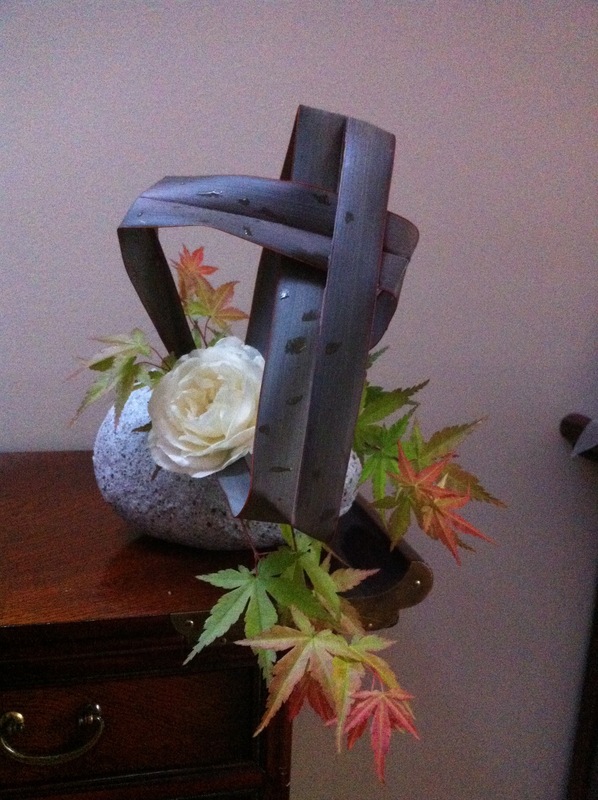 Very often ikebana is misunderstood as an art that is too hard. We often see the elaborate and huge work of the masters and put ikebana in the “too hard” box not realising that ikebana can range from the garden size installation to the “1 flower 1 leave” tea cup arrangement. While a 8 metres installation might takes weeks to plan and days to construct, a tea-cup sized arrangement can be a result of hours of meditation too. But still there is always a challenge to make the what I call the “ASAP ikebana”- quick arrangement to brighten up your day or a short meditation time for you to take your crowded mind away from busy life. All you need is a few leaves/ branches/ flower(s). I made this after running around to finish the laundry, the pile of dishes in the sink….! And those 5-10min was great – helping me to regenerate! No planning, no sketching- just making use what I’ve picked from my garden. And I must admit I’m lucky to have a pretty good garden to give me at least three different kinds of Japanese maples to start with. So… What have you got in your garden? What can you make in 5 min? May be your three-days-old vase need rearranging? Or may be you can pick up a mixed bunch from the local fruit shop on your way home after a long day work. Take the challenge and have your mind refreshed….Ah….